One of the few sporty SUVs on the market, the CX-7 is affordable, practical and fun to drive. Larger than Honda CR-V or Toyota RAV4, but smaller than Ford Escape or Honda Pilot, the CX-7 is a five-seater with a 4-cylinder engine. It is available as a front or all-wheel drive. The 244-hp turbocharged 2.3L motor was standard. For 2010, a non-turbo 2.5L engine was added to front-wheel drive models. The interior is tight and sporty. The visibility is good in the front, but limited in rear corners. Cargo space is good; the rear seats fold down almost flat. Where the CX-7 stands out is the driving experience. A very few SUVs feel that sporty, confident and balanced on the road. That is especially true for a turbocharged model, as it comes with wider tires. 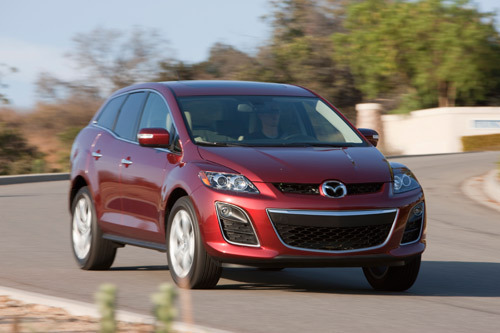 The non-turbo front-wheel drive CX-7 is more practical and better on gas. The ride is on the firm side, but quiet and comfortable. Is Mazda CX-7 reliable? Will it be expensive to maintain? How is the fuel economy? Let's find out. Engine: The turbocharged direct-injected 2.3L MZR DOHC motor has plenty of power but thirsty. It's an advanced hi-tech motor, but expect higher repair costs in a long run. For the turbocharged engine, premium gasoline is recommended (required for the 2007 model). Read also: Should you buy or avoid a turbocharged car? The 161-hp non-turbo 2.5L engine shared with Mazda 3 and Mazda 6 has a more conventional design and runs on regular gasoline. The 2.5L engine is proven to be reliable and not very expensive to maintain. Unfortunately, the 2.5L non-turbo engine is only available in front-wheel drive models. Both the 2.3L-turbo and the 2.5L engines have a timing chain; there is no timing belt. Safety: Antilock brakes, stability control (DSC), side and side curtain airbags are standard. The 2007-2010 CX-7 received five stars in frontal and side-impact NHTSA crash tests. The 2011 and newer models were not tested. Fuel Economy: The 2010-2012 front-wheel drive CX-7 with the 2.5L engine is pretty good on gas and it can run on regular gasoline. The CX-7 2.3L-turbo is rated poorly even on premium gasoline. Handling: True to the Mazda Zoom-Zoom spirit, the CX-7 handles sporty, with minimal body roll in turns. The steering is precise and readily snaps back to center when driving straight. The 2.3L turbo engine offers plenty of power, The 0-60 mph time is around 7.8 seconds, which is good for a 4-cylinder SUV. The 2.5L engine is okay, but it won't overpower you. Overall, the CX-7 feels like a well put-together sporty wagon rather than an SUV. Pros: Sleek styling, sharp interior, zoom-zoom handling, crash test ratings, decent fuel economy (2.5L models), moderate price. Cons: Rear visibility in the corners, cramped driver's place, no AWD model with 2.5L engine, fuel economy for the 2.3L turbo engine, interior materials could be better. 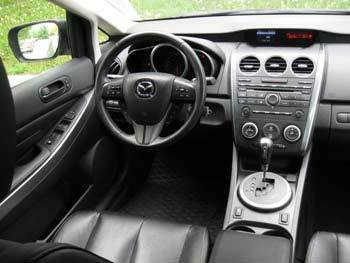 Mazda CX-7 problems: Problems with the 2.3-liter turbo engine, including Check Engine light, issues with a timing chain, VVT and turbocharger are fairly common; repairs are expensive. Check Engine light issue are also common in a 2.3L turbocharged engine. A bad air/fuel ratio sensor (front O2 sensor) can cause the P2187 lean at idle code and jerking on acceleration. The related Mazda service bulletin recommends replacing the sensor with an updated part. Various problems with the front end (control arms, steering rods) are often reported. There was a recall for lower control arms issued in 2016. Check details at the NHTSA website. A faulty wheel bearing can cause a humming noise that gets louder with speed. Replacing a wheel bearing can cost from $280 for the front to $520 for the rear wheel bearing. A bad EGR valve can cause the Check Engine light to come on with the code P0401. A faulty EGR valve will have to be replaced ($450-600). Read more: EGR valve: problems, symptoms, testing, replacement. Overall: If you are looking for a turbocharged CX-7, be aware that they are thirsty and not very reliable, plus a turbocharged engine needs to be religiously maintained to last. If this doesn't stop you, it's a fun to drive, sporty vehicle. On the other hand, the 2010-2012 Mazda CX-7 with the 2.5L engine is more practical, fuel efficient and mostly trouble-free. Of course, the 2.5L engine is available only in the front-wheel drive models. Among the competitors, Honda CR-V is one of the best. Toyota Rav4 is not as sporty but more reliable. For driving enthusiasts, we recommend Mazda CX-5, as it's not only sporty, but also good on gas and reliable. What to look for in a used Mazda CX-7: We recommend opting for the 2010-2012 CX-7 with a 2.5L engine, as it's more reliable and fuel efficient as well as less costly to maintain. The 2.3L-turbo engine should be avoided altogether. If you still want a turbocharged model, consider buying a good extended warranty to protect yourself from unexpected repairs. A turbocharged engine also needs to be maintained well to avoid problems. 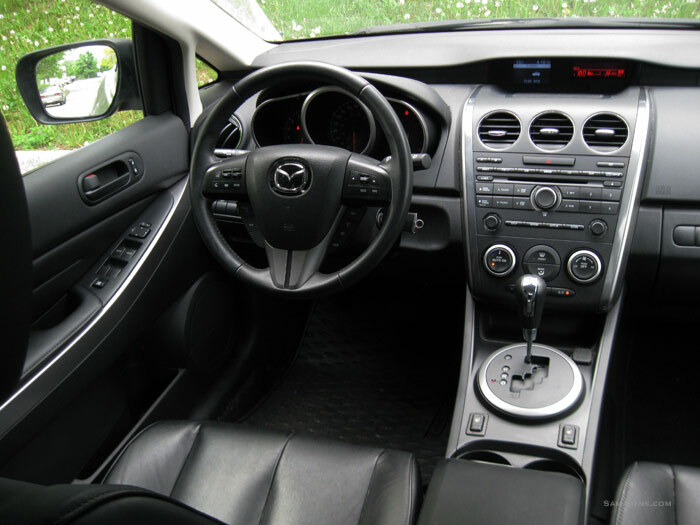 When checking a used Mazda CX-7, see if the driver seat is comfortable. Check the visibility. Avoid the car if you notice a white or blue smoke from the exhaust or if the engine is too noisy when started. If possible, check the service records to verify if the oil changes were done regularly. Test the air conditioner, a number of CX-7 owners mentioned that the A/C is not strong enough in a hot weather. During the test drive, see if the car holds a straight line well and doesn't pull to one side or another. Watch out for tire noises and wheel bearing noises, such as humming or rumbling. See if the transmission shifts smoothly. MY Mazda US Owners website - owner's manuals, how-to videos, warranty info. 4-cylinder 2.5L DOHC 16-valve 4-cylinder with VVT.